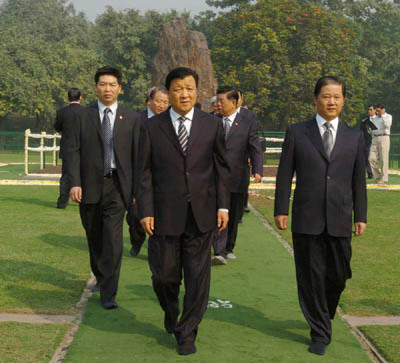 At the invitation of Indian government, Mr. Liu Yunshan, Member of the Political Bureau and the Secretariat and Head of Publicity Department of the CPC Central Committee led a CPC delegation to arrive in New Delhi on October 27 and began a 5-day friendly visit to India. 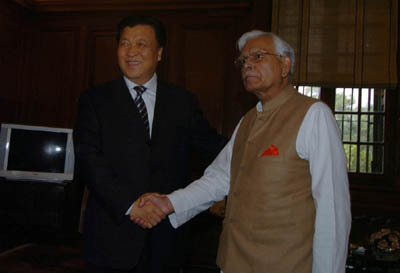 On October 31, Mr. Liu Yunshan met with Mr. Natwar Singh, Indian Minister of External Affairs in New Delhi. Mr. Liu Yunshan said CPC and Chinese government attached great importance to developing strategic partnership for peace and prosperity with India. The development of friendly and cooperative relations between China and India not only conformed to the wishes and interests of the two peoples but also was conductive to regional and world peace and development. The CPC stood ready to play an active role in enhancing the understanding and friendship between two peoples and pushing forward the relations between the two countries. Mr. Singh warmly welcomed Mr. Liu Yunshan's visit to India when bilateral relations were developing in depth and believed the visit would further strengthen the friendship and cooperation between the two countries and push forward further development of the bilateral ties. On the same day, Mr. Liu Yunshan held talks with Mr. Jaipal Reddy, Indian Minister of Information, Broadcasting and Culture on the exchanges and cooperation between the two countries in information, culture, broadcasting, film, television and other fields. 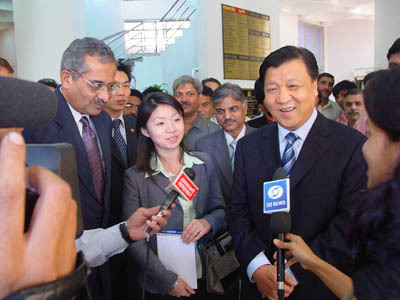 Mr. Reddy expressed warm welcome to the visit of Mr. Liu Yunshan and his entourage and gratification at the increase in exchanges between Indian and Chinese press and the number of Indian journalists posted in China. Mr. Liu Yunshan spoke highly of the achievements by India in the fields of economy, science and technology and the development of China-India friendly ties and believed there was a broad prospect for exchanges and cooperation in information, film and television, culture and other fields. He hoped the two countries could strengthen mutual visits of journalists and increase the number of journalists posted in each country in a bid to enhance the understanding and friendship between the two peoples and push forward the further development of relations between the two countries through large number of reports by the media. During the visit to India, Mr. Liu Yunshan also met with Mr. Prakash Karat, CPI (M) general secretary, paid homage at the Raj Ghat and Shakti Sthal respectively and visited the Doordarshan and All India Radio. 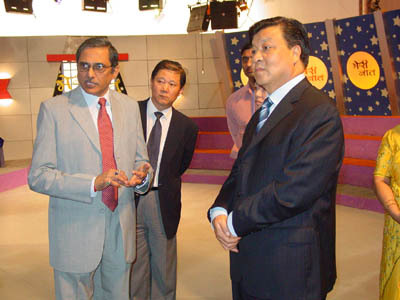 Mr. Sun Yuxi, Chinese Ambassador to India, attended the above-mentioned activities.